Lord Vishnu is the Maintainer God, or the God of both Material and Spiritual Wealth. He gives a 200% Life! A pilgrimage to these Holy Abodes of Lord Vishnu will not only increase your wealth attraction but will give you infinite merit, solace and meaning to your life’s journey. The 1st stop is Veera Raghava Perumal Temple in Thiruvallur, one of the 108 divya desams or Divine Places of Lord Vishnu, located on the Chennai Tirupati highway, 30 miles from Chennai. Lord Vishnu vanquished two demons here and the temple vimana or dome covering the inner sanctum is called Vijayakoti or victory. Legends say that a saint called Salihotra came here on a New Moon and performed penance to earn the grace of Lord Vishnu. After severe testing, the Lord blessed the sage and granted him boons or wishes. The sage wanted nothing except that the Lord should stay in this place and cure the diseases of people who seek his help. 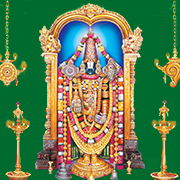 Lord Vaidhyanatha Veera Raghava Perumal manifested as an answer to the prayers. New Moon days are considered auspicious to visit the temple. Vishnu is in a reclining position here on Adisesha, the King of the Snakes, with his right hand on Salihothra’s head. The sage is in kneeling position and his left hand in Gyana mudra or knowledge giving hand position. From the Lord’s navel emerges Lord Brahma, his holy feet are gold plated and his right foot is bent to a side meaning he is ever ready to help a devotee in need. The Lord’s consort here, Goddess Kanakavalli Thayar, gives darshan to the devotees every Friday to fulfil all of their desires. A unique feature of this temple is that abhishekams are only performed with sandalwood oil and nothing else. The temple tank called Hritapanasini is considered very holy because even the sight, touch or dip in it, would cleanse all sins and free the heart of anguish. The 2nd stop, Govindaraja Swami Temple, is 1 km from Tirupati railway station and 2 kms from the Tirupati bus stand. It is a well known temple in Tirupati as it was consecrated by Saint Ramanuja in 1130 A.D. Govindaraja Swami is considered to be the elder brother of Lord Venkateshwara. The temple has two main shrines dedicated to Lord Vishnu. One where he is in a reclining posture on Ananta, the celestial snake and the other shrine he is Lord Parthasarathi or Lord Krishna, flanked by his consorts Rukmini and Sathyabama. A shrine is dedicated to Goddess Lakshmi who has four hands. The upper hands hold lotus and the lower two are in the mudras for fearlessness and benediction. An interesting fact about the temple is that no abishekam or holy bath/hydration ceremony is given to the presiding deity as it is made of clay. The next or 3rd stop is the abode of Lord Venkateshwara. The name Venkateswara stems from Vem meaning sin, Kata meaning destruction, and Ishwara meaning Supreme Lord. He is the lord who cuts off all sins of the devotees who take refuge in him. The temple is located at the top of the 7 hills in Tirumala and covers an area of 2.2 acres. The dome or vimana, above the principal deity is covered in solid gold. The dwajastambha or the flag mast is gold plated and the gates of inner sanctum are also gold plated. The deity is always adorned with fine jewellery and most remarkable among them is the diamond crown set in diamonds from Antwerp, the diamond capital of the world. This piece of jewellery is one of a kind in the entire world. Another exquisite piece is the emerald called `Meru Pacha`, which is the biggest emerald in the world. The invaluable possessions of the Lord, all in gold, silver and precious gems are estimated over 250 crores and gold weighs about 640 kgs. Lord Venkateshwara holds a conch, disc, mace and lotus made of gold. His right hand is turned outward offering benediction and his left hand is turned inward. The tilak on his forehead is made using camphor. Lakshmi Devi is on his right chest and Padmavathi Devi on his left chest. In Kali Yuga, it is believed that one can attain liberation from birth and death by praying to Lord Venkateshwara as he is a great “bestower of boons”. Pilgrimage to Tirumala is said to accrue merit beyond measure as laid down in the holy texts of Rig Veda and Ashtadasa Puranas. Lord Venkateshwara is also called Govinda by his devotees as they believe that he would wipe away their misery and hear their pleas. The lord is known to perform miracles to his devotees and to those who repose his faith in him. Millions of people throng his abode every year with an unshakeable belief that the Lord is known to render help especially in times of misfortune. This 4rth temple stop is Tiruchanur, 5 kms from Tirupati, still in Tirumala district. It is believed that a pilgrimage to Tirumala is complete and fruitful only if one takes darshan of Goddess Padmavathy in Tiruchanur. Tiruchanur is also called Alamelu Mangapuram. Padmavathy is the consort of Lord Venkateshwara, the presiding deity of Tirumala. Padmavathy Temple It is one of the most famous Mahalakshmi Temples in India. She sits in padmasana (cross legged position) with four arms, the upper two arms holding lotuses and the lower ones in the mudras (hand positions) of abaya and varada, meaning fearlessness and benediction. There is a story behind why the temple of Padmavathy is apart from Lord Venkateshwara. Lord Vishnu showed reverence to saint Bhrigu even after being kicked on his chest, where the Goddess Lakshmi abides. In anger, Lakshmi left Vishnu and reached Patala Loka. She was divinely guided to do penance for 12 years and emerged from a golden Red Lotus in Padma Sarovar Lake in Tiruchanur. On the 13th year she appeared to Lord Venkateshwara as Goddess Padmavati seated on a red lotus and wished to be reunited with him. Lord Vishnu incarnated as Lord Venkateshwara with the sole purpose to marry and reunite with Lakshmi or Padmavati. The marriage ceremony of Padmavathy and Lord Venkateswara is held once a year. She rides on her mount, the white elephant to meet the lord in Tirupati. Prayers and poojas to the Goddess on Fridays are considered to bring auspicious results. This temple is situated on top of hill in the town of Kanchipuram called Hastigiri or Athigiri meaning elephant hill as the white elephant of Indra, the King of Heaven, is in the form of a hill here and bears the lord. The presiding deity is Varadaraja Swami and his consort is Perundevi Thayar. The Lord is seen in standing position facing west and the statue is huge, second to Tirupati Balaji. Devotees seek blessings for good education, peaceful family life and prosperity. Lord Brahma conducted a yagna or fire ritual to purify himself at Kanchi with his consorts, Gayatri and Savitri. Saraswati being excluded was furious and so flowed excessively causing floods as River Vegavati. Lord Vishnu at the behest of Brahma checked the flow of floods by placing himself in a reclining position across the river. At the completion of the fire ritual, Vishnu emerged from the flames of the ritual and gave darshan to Brahma. As he granted boons to Brahma, he is called Varadaraja Perumal. He is also called Devaraja Perumal. There is also a statue of the Lord in reclining form that is 40 ft in length that is worshipped only for 10 days once in 40 years. Another important feature of the temple is the worship of the golden lizards to ward off the evil caused due to the falling of the lizards on body parts. The images of the silver and golden lizards are found outside the inner sanctorum with images of Sun and Moon too. Touching them washes away sins and give prosperity. The 6th and final temple on the tour is located in Tiruninravur 25 kms from Chennai. The temple was built in the 6th century during the Pallava rule. It is said that the Lord appeared in the dream of the Pallava ruler and asked him to build a temple for him. Legends say that the ocean Lord worshipped Lord Vishnu here and Mahalakshmi came and stayed here.The presiding deity is Bhaktavatsala Perumal which means one who loves his devotees. When Kubera lost all his wealth, he prayed to the Goddess of this temple and got it back through her grace. She is praised as Vaibhava Lakshmi here. The divine serpent Adisesha has a special shrine in the temple. Worship relieves those affected with the adverse effects of Rahu-Ketu planets and strengthens the mangalya balam or auspiciousness of women and gives longevity to their husbands.